Mareham Le Fen (blue) v Eagle Utd (yellow). Connor Preston (blue), Connor Wroot (yellow). Sam Strokes netted an extra-time winner as Coningsby Reserves lifted the Main Ridge Take-Away Reserve Cup. Coningsby took the lead at Boston Town’s DWB Stadium through Nathan Garfoot’s penalty, only for Sam Husband to level for Pointon Reserves. But in the additional minutes of Thursday night, Coningsby had the final say. In the Sharman Burgess Sports Cup quarter-finals, Railway Athletic beat Leverton 2-1 on Saturday. Kirton Town won 2-1 at Skegness United, whilst Skegness Town Reserves won 1-0 at Boston College. In The Workforce Unlimited Premier Division, Pointon bounced back from last week’s defeat to record a 7-1 win at home to Wyberton Reserves. Coningsby had a big 5-0 win against rivals Billinghay Athletic. Swineshead Institute travelled to Fishtoft and, despite goals from Fishtoft veterans Kevin Woods and Simon Moses, Swineshead bagged the three points after a strong 5-2 victory. Old Leake put up a fight against Fulbeck United and ran out 3-2 winners, Benington beating Spilsby Town by the same scoreline. Horncastle Town Reserves top Division One and they added another three points to their tally after a 2-1 win against Old Doningtonians. Friskney put six past Pointon Reserves, with Greg Brown (five) and Victor Sibert on target. Neither side could find a break the deadlock at Woodhall Spa as they hosted Swineshead Reserves. In Division Two the race for promotion continues as FC Hammers moved into top spot after a close 1-0 victory against Park United. Railway Athletic Reserves had a good 3-0 away win at Boston International, whilst Colsterworth put five past Caythorpe. Boston Athletic had a close game at Wyberton A, nicking it 3-2 while Coningsby Reserves put two past Holbeach Bank. 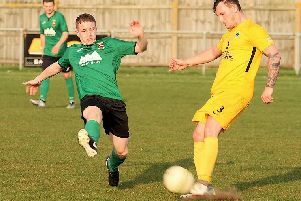 In Division Three, promoted Eagle United put eight past Mareham, whilst Spalding Harriers scored nine times against Old Doningtonians Reserves. Skegness Town A were looking to protect their unbeaten home run but Fosdyke Reserves had other ideas. Skegness took the lead early on, but three goals from Ashley Davis and one from Alex Cammack, secured Fosdyke the deserved 4-2 victory.